Coming off their hot streak with the Metroid Prime series, Retro Studios tries their hand at rebooting another famous Nintendo mascot: Donkey Kong. 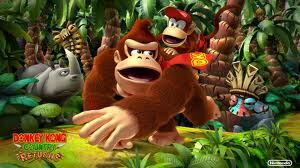 While not adding much to the formula, Retro Studios keeps what made the original Donkey Kong Country games great, while simultaneously building upon it and perfecting it. What the game lacks in innovation, it makes up for in sheer fun, brutal difficulty (in the most positive ways, of course), and beautiful scenery, resulting in a game that bests its beloved counterparts.